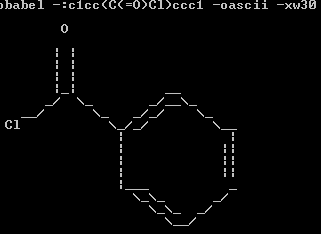 If the range of depiction output formats (PNG, SVG and ASCII currently) provided by Open Babel is not enough for you, you can easily draw molecules yourself using the information provided by the new paint utility format. Other fruit are available, and if you would like me to put together a similar image for you, contact me and maybe we can work something out. As an exercise for the reader, it would be cool to see the same thing done in 3D using say Blender or Povray. I've added an output option to help tune the aspect ratio (-xs). Also, multimolecule output is supported, and a fun pastime is to watch ASCII depictions of large libraries fly by at the command line. I've just been adding depiction support for double bonds with unspecified stereo, and thinking about how this should be done: a squiggly bond for a substituent on the double bond, or make the double bond itself twisted? Actually, I didn't have to think too much as Rich and others (also mcule) have already worked through these same issues. In short, the IUPAC recommendation (from 2006) is best avoided, and a twisted bond should be used instead. Credits: Twisted double bond by me. Everything else of depiction by Chris Morley and Tim Vandermeersch. Structure layout by Sergei Trepalin. In Part I, I showed how to embed PNGs, automatically generated from SMILES by obabel, into LaTeX documents. An alternative approach is to use the SVG output from obabel. 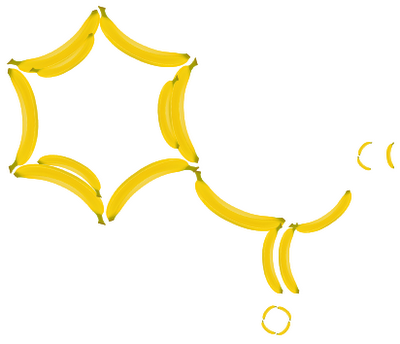 You can also embed the material as a vector graphic, of course. Inkscape doesn't seem to support pipes, and rsvg-convert gives ugly output, but I'm sure there's other options. Also, if you don't want to call these applications when the graphic files aren't out of date, then use the code snippet found at the top of the 3rd page from this article. The resulting PDF looks better than the original (though it could be because I didn't handle the PNGs properly in the first PDF). A nice little touch in Jakob's version is that an error box appears in the PDF if there is a problem generating the image. A bit more polish is needed before these methods can be used wholesale by others. 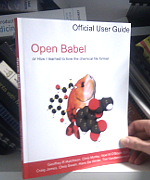 If you know a bit about LaTeX, have a go at an obabel package for CTAN.